The baths had three furnaces used to heat water for the various bathing pools and to provide underfloor heating, the hypocaust. The hypocaust of the Great Baths complex, Ancient Dion. Carole Raddato from FRANKFURT, Germany. This file is licensed under the Creative Commons Attribution-Share Alike 2.0 Generic license. The furnaces burnt wood to heat the baths complex and the water used by visitors, so Ratae probably owned or controlled woodland to supply its public baths. These woods may have been on the slopes to the west of the River Soar and workers would have been regularly engaged in cutting, storing and transporting wood for the baths. Hot air from the furnace moved under the baths, known as a hypocaust, a forerunner of modern central heating. Short columns of brick or tile supported a stone floor, created a space that allowed hot air from the furnaces to circulate through the building as far as the cold bath house, which had no cellar. 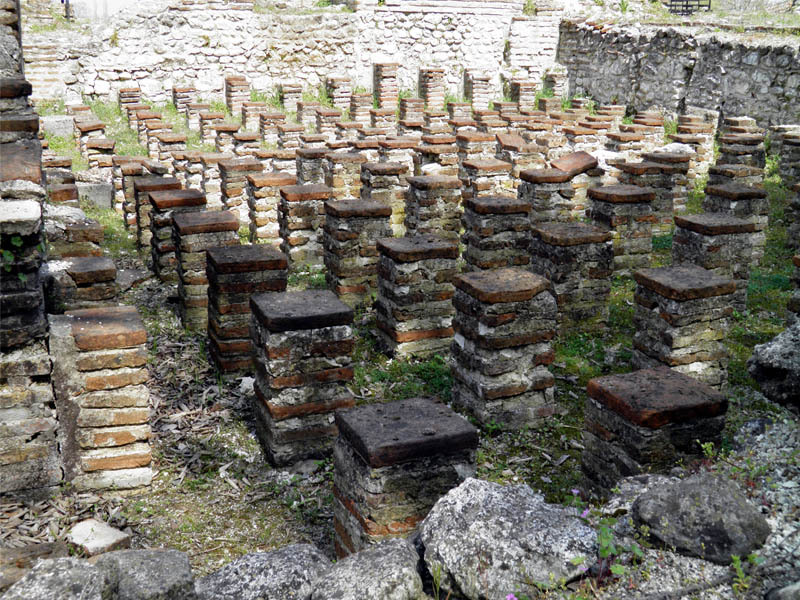 The hypocaust was divided into three to correspond to the three furnaces. It was divided like this so that the baths could operate with two furnaces at a time – the third being cooled down and cleaned by the slaves working at the baths. The furnaces also heated water for the tepidarium and caldarium. Some baths in the Roman Empire also contained a very warm area, called a laconium.